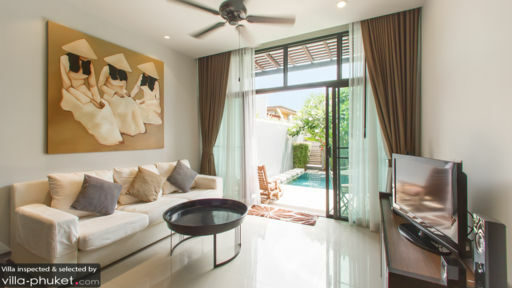 Just a short distance from Nai Harn beach and the beautiful shores of Phuket, Villa Amiria is a two-bedroom holiday retreat, perfect for couples or small families. 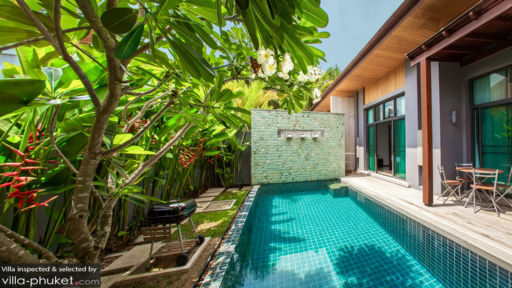 The modern and contemporary style of the villa fuses magically with its rich natural surroundings making for a picture-perfect beginning to a great Thai adventure on this beautiful island! Enjoy the nearby sights and multiple activities around the area, while you indulge in the comfortable and A-class quality services at Villa Amiria. There are two bedrooms at Villa Amiria, one of them being the lavish master suite and the other one a guest bedroom. The master bedroom provides direct access to the swimming pool and garden, perfect for when you wish to take a dip early morning! The room is furnished with a king-sized bed and traditional Thai side-tables adding colour to the room. There is a lot of wardrobe space in the room for your luggage. The guest bedroom is also well-furnished with a double bed and both the rooms are air-conditioned. There is a massive bathroom which includes a soaking bathtub, a shower area and a dressing area, complete with a huge mirror and a chair. 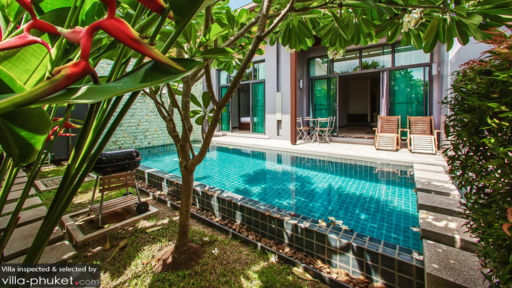 The private walled garden overflows with tropical foliage, shielding you from sight and giving you the privacy and exclusivity that is much-needed after a busy city lifestyle. Nestled in the centre is the lavish swimming pool, which has a water feature towards the end flowing directly into the pool. A meditative and calming atmosphere adds to the peaceful ambience created by the beautiful outdoors at Villa Amiria. For some extra fun, the villa provides a BBQ facility, in case you wish to grill your own dinner and enjoy under the starry night sky! The outdoor dining table is an ideal set-up for al fresco dining! The modern and stylish living area is just off the swimming pool and opens via glass sliding doors. The room is air-conditioned, spacious and you can rest on the plush and comfortable couches and watch some television if you decide to stay indoors or after a tiring day around the beach! The décor of the room is minimalist, keeping things light and cosy, where everything comes together marvellously especially with natural lighting flooding the room during the day time. The TV is accompanied by surround sound, in case you wish to watch a movie with your friends and family! There is a dining table provided for the guests, which can seat 4 people comfortably. The fully-equipped modern kitchen is another striking feature of the villa being fully-stocked with all the necessary appliances and amenities. If you love to cook, you will definitely love this kitchen! The room itself is well-lit and provides access to the two bedrooms at Villa Amiria! The services provided at Villa Amiria are excellent and are in place to ensure that your stay is free from any issues and delays. The staff is friendly and accommodating towards the guests, so you do not feel uncomfortable during your stay. The villa also offer free WIFI for your tech needs! As it only a couple of kilometres away from Nai Harn beach, it is the best place to go and experience the sun, sand, and water! The Nai Harn lake is also located nearby, so you have access to abundant natural scenery and sights for you to enjoy and relish in Phuket! Beautiful Villa, amazing pool. I travelled with my partner and we loved the security and privacy being our first time in Phuket. Was truly a relaxation Villa, love the fact it was very hot and warm outdoors but regardless of the heat the air conditioning was reliable. The place feels like home. The only thing to consider is the location as it is quite far from the main cities but the locals are very helpful and we rented a motorbike which was very convenient. Highly recommended or a rental car.